General Kenneth Phillips, retired soldier, fastidious drinker of tea, and since his eightieth birthday blind, deaf and dumb, or so Lenore, his part time carer, would have you believe. “I’m telling you, ever since his eightieth birthday he hasn’t said hardly a word. He just stares into space or occasionally mutters something rude about the cup of tea I just made him. Don’t you Kenneth?” said Lenore, a chubby, red faced woman in her forties with a habit of asking questions she doesn’t want answered. “He used to be such a lovely man, so full of life. Well as much life as you can expect at that age I suppose. Isn’t that right Kenneth?” she asked again, taking a three finger chomp from her Golden Gaytime; honeycomb pieces raining down on her brightly coloured floral dress. I shot a glance at my rear vision mirror and I’m almost certain I saw Kenneth give her the finger behind her back. I looked again but the old man was just sitting there, hands in his lap, staring blankly out the window. I nodded my head, pursed my lips and gave a half hearted, “yeah.” Lenore’s rambling continued for the next five minutes. I completely tuned out, offering little more than “sure” or “ahhh ok”. I doubt Lenore cared if I was listening or not. She could hear herself and that seemed enough to make her happy. “Next left!” she said suddenly, raising her voice. “Now you’re going to drop me here on the corner. Kenneth lives over in Erskineville, about 5 minutes away. I’ll enter his address in now,” said Lenore, jamming her sausage fingers into her iPhone screen. “Stupid bloody cow, good riddance!” growled Kenneth. I turned my head sharply to make sure I wasn’t hearing things. My remaining passenger, the old man hunched over in my back seat, was now sitting upright, his blank expression replaced with a look of self righteousness. His dull, blank eyes now a sparkling blue; alert and brimming with life. “Ooo yeh, I like this one. Turn it up please sir!” asked Kenneth with a grin. Mouth gaping I turned up the radio as Kenneth bobbed his head and tapped his knee from my back seat. Where had this man been hiding? I wondered, as I shook my head in disbelief and let out a wry chuckle. I hadn’t noticed before but he was a seriously snappy dresser. A pair of pressed grey pleats, perfect length, showed just half an inch of crisp, navy coloured socks. The socks met a pair of polished, brown leather Oxford’s with precision tied laces and hardly a scuff. Up top he wore a bright red woollen jumper with a tartan collar neatly folded at the neck. A grey trilby sat slightly lopsided on his full head of sparkling white hair. His face was an old map. Sunspots of varying sizes, from shirt buttons to 50 cent pieces, dotted his forehead and cheeks. A lightning bolt scar jutted from his bottom lip to his chin. There was one feature, however, that had no business being on such a weathered, old face. Fresh, piercing blue eyes, like two opals in a muddy creek, flashed with youth and energy. Lenore was wrong about Kenneth, he hadn’t kicked the bucket just yet. We pulled into Kenneth’s street in Erskineville. Both sides of the road were packed in tight with old terrace houses, all chipped paint and rusted iron. Kenneth’s place was number seventy eight. I couldn’t believe my eyes when I saw it. A single story suburban house hidden among the urban sprawl. Complete with tidy front garden and a swinging silver gate, Kenneth’s cottage slept in the shadows of the 18ft terraces on either side. He even had the classic style freestanding wooden letterbox which was overflowing with junk mail. I pulled into the parking spot out the front and ended the trip. “There you go Kenneth, enjoy the rest of your day,” I said with a smile and a nod. “Please, call me Ken,” he replied, straightening his trilby with his left hand. “You can’t go just yet son, I need your help with something out back,” he said, nodding to number seventy eight and tapping his nose with his forefinger. “Oh ok, no worries,”I replied, a little taken back by the request. This wasn’t the first time a passenger had asked a favour. A week prior I somehow got roped into carrying a washing machine down three flights of stairs in an apartment complex in Waterloo. The old Lebanese woman paid me with a tupperware container jam packed with crispy, gooey baklava. It was absolutely worth the hassle. I had already put on three and half kilograms since my first day as an Uber driver, a few Middle Eastern sweets would just add another centimetre of soft flesh to fold over my seatbelt. I followed Ken through the silver gate, along the pebblecrete path and into his humble home. There it was, that smell. It took me back twenty years to my own Grandfather’s house in Boorowa, a small country town in Central West New South Wales. A combination of old furniture coated in dust, antiseptic (Dettol) and lavender soap. Talcum powder and mothballs. I breathed it all in and felt immediately comfortable in my new surroundings. Doilies on the arms of chairs, cricket on the fat back TV and a cockatiel in a cage above the fireplace. “Fancy a cuppa?” asked Ken as I basked in nostalgia. “Take a seat son, won’t be a tick,” he said, walking through to the kitchen I imagined would be an exact replica of my late Grandfather’s. I sat down on the double seater lounge just in time to see Mitchell Starc bag a wicket. While the Kiwi’s reviewed the LBW decision I ran my eyes over Ken’s lounge room; a well kept time capsule. Behind the birdcage and above the fireplace was a large, wooden framed, black and white photograph. It was an image of an army squad, with twenty uniformed men with cold, focused expressions and steel rods for backs. I squinted across the room, trying to find Ken in the group. Ken emerged from the kitchen a few minutes later carrying my cup of tea and a blue tin of biscuits. Scotch fingers, milk arrowroots and ginger snaps. “See, this is how you make a cup of tea. Take a look at the colour,” said Ken placing the mug on a coaster on the wooden coffee table. “Boiling hot water, throw the bag in and wait a minute. Grab yerself a spoon and pinch the bag against the edge of the mug. Remove the bag. A splash of milk and a quick stir and you’ve got yerself a perfect cuppa,” he said proudly, offering me a biscuit to dunk in my tea. “If one more person hands me a cup of tea with the bag still in it I’ll not be drinking it. What’s the matter with people? Bloody lazy, that’s what!” he said sternly. “Now when yer finish that I’ll be out back in the shed. I’ll see you out there, alright?” said Ken, turning and walking through the kitchen and out the back door. “No worries!” I said with a dry mouth full of milk arrowroot, spraying the coffee table with crumbs. I sipped my tea wondering what Ken needed a hand with. I imagine he needed something heavy moved. Please not another washing machine. Sitting on a thick, hardwood shelf which ran along the right hand side of the shed were three large silver canisters, each about a metre high and half a metre wide. Thin, clear plastic tubing connected all three canisters, with one final tube connected to a keg beneath the shelf. “Beer,” said Ken proudly. “Been brewin me own for years! Did yer see my garden of hops?” he asked. “Were those the green plants down the side?” I responded, unable to to hide the look of surprise and wonderment on my face. I did as Ken asked. I had worked countless shifts as a barman and knew how to disconnect the keg without getting a faceful of beer. I picked up the keg and turned to walk out of the shed when Ken exclaimed, “wrong way son, over herë!” I turned sharply to see him walking toward the back of the shed. Surely he didn’t just want me to lean it up against the back wall. Ken retrieved a set of keys from his pocket when he reached the back of the shed. I stood behind him, squinting over his shoulder to work out what he was up to. He reached forward and pushed the key into a small opening in the wall. I heard a loud click when he turned the key. He then pushed on a section of the wall and it folded back to reveal a narrow passageway. Ken’s shed was connected to the building at the back of his house. What the hell was going on? He flicked on a lightswitch and the tunnel connecting the two properties was now clear to see. It was about four metres long and connected to another door on the other side. Without saying a word Ken led me through the tunnel to the other door. He pushed it open and a gust of cool air swept over me. The door led to an enormous, concrete room with stacks of kegs leaning up against the far wall. Long, thick tubes ran from the kegs up the walls and into the ceiling. We were in the keg room of a pub. I was speechless, gobsmacked, flabbergasted. “Put that down over there,” said Ken nonchalantly, pointing at the rows of kegs at the far wall. He didn’t even bother to look at me for a reaction. “Hahaha are we in a pub Ken?” I asked in astonishment. “Sure are! Now, you must be thirsty. We’re almost there,” replied Ken walking to yet another door at the back of the room. I followed Ken through the door, up a small flight of stairs and into the pub. The air was much warmer in the pub. It was empty, besides the barman standing at the taps. “Ayyyy Ken! How are ya mate?” announced the young, bearded barman with genuine enthusiasm. “Andy, good to see yer son,” Ken replied warmly, taking off his trilby and laying it down on the bar. “I’ve just dropped off another batch in the cool room alright?” said Ken, pulling out a bar stool and taking a seat. Andy opened the till behind the bar and handed Ken a wad of fifties. “Everyone loved the last batch Ken, keep it coming mate!” said Andy, shaking his head and grinning widely. Andy had exactly the same look on his face that I did. “Thank you, now two of mine please sir!” said Ken, folding the fifties and stuffing them into his pocket. Ken raised his glass before taking another another long, hard gulp from his beer. I did the same. I placed my hand on Ken’s shoulder and bid him farewell before leaving the pub, this time through the front entrance. So where does one try some of Ken’s home brew!? Hi Sarah! Haha I don’t want to give away his quiet watering hole. Ken is an extraordinary man. I am blessed to have met him. Thank you for reading. Reading this put a smile on my face that wont go away easily! And now I can’t stop smiling. Thank you for reading. Hi Brenda, thanks for reading! I change the names and suburbs of my passengers to protect their anonymity. I wish I could tip you off! You will just need to embark on an all Sydney pub crawl to find Ken’s brew! Great story mate, perhaps a standout amongst the rest of the good work? Keep it up and look forward to the book! Hi, just wondering where you got the header image on this page. I’ve seen that old fella before, what’s his name? 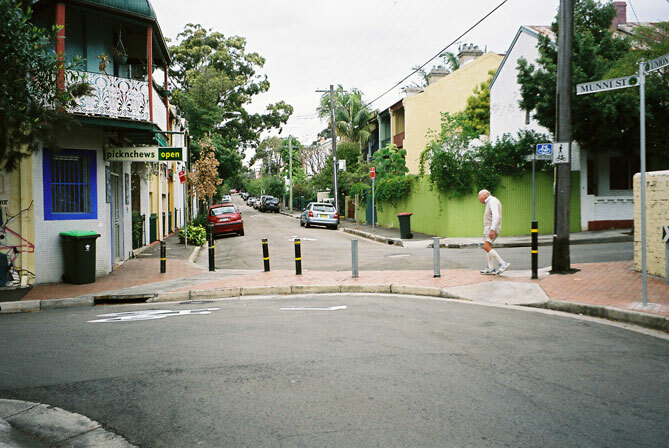 Hi Aung, I found this image on a site called: http://www.walksydneystreets.net . I believe that man’s name is Alan. Ben, this post is in its own way both hilarious and touching but also a little depressing, I can only hope I’m as feisty as that at his age. You’ve captured the whole encounter beautifully. I feel sorry for ‘Lenore’ and her inability to show any empathy for ‘Ken’. I’m sure there is a rich vein of stories like this that other Uber and taxi drivers could tell, I just wonder why there aren’t more. Of course in a way I’m glad there aren’t because if there were you wouldn’t have shown up. I heard something sort of similar this after noon on ABC666 Canberra. They interviewed a driver of the gov’t bus service’s mobility assistance bus, with stories of getting to know his passengers, and of them meeting and making friends with other passengers, going out for meals and coffee with each other. PS. Any job where you get a good cup of tea is a good job! And what a cup tea it was! I’m sure Lenore has a good heart, though like many of us, she doesn’t take the time to really listen to those around her. Thank you for reading and your kind words. It’s definitely one of my favourite stories.